WordTracker sells access to its keyword database based on the concept that meta search engines have data which is much cleaner than regular search results. Regular search engines have screen scrapers, rank checkers, bid management tools, click bots, webmasters, and all sorts of interesting tools scouring through their networks. WordTracker collects its data from Dogpile and MetaCrawler, a couple smaller meta search engines. The sales angle is that the keyword data is clean, but is it? It has a small search database compared to the search volume seen on large engines. The small sample size means errors will be blown out of proportion. A friend just recently searched and saw a particular SEO firm spamming a ton of fake search referals for their services. 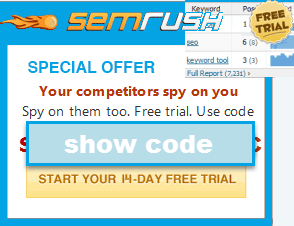 I guess that is fairly cheap marketing if you are looking for money from a bunch of naive webmasters. Lets say you find out that the phrase gold nuggets is profitable. You run a search bot to search for golden nuggets. You do it over and over and suddenly golden nuggets looks like the money maker. Your competition trips over each other trying to optimize for golden nuggets (where there may be little to no money), while you are headed to the bank to cash your check. Much like pay per click, some SEO markets are based on working the margins. If you can get your competitors to get in an SEO war in an area of lower profit then eventually they may get frustrated and quit or go after other markets. Many people focus on improving their sites, but once you get near the top providing competing sites adequate amounts of disinformation may help keep you there. In SEO the only numbers you can trust are the dollars in the bank account at the end of the day (assuming they are not there from a fraudulent transaction).